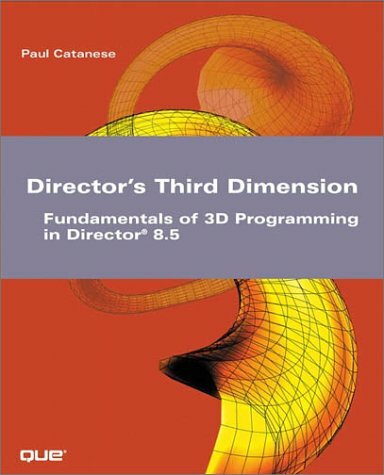 Designed for Director users with little or no 3D programming experience, Director's Third Dimension: Fundamentals of 3D programming in Director® 8.5 is the most comprehensive guide for those aspiring to learn how to create and control 3D content with Director 8.5. By employing easy-to-follow examples, detailed demonstrations with in-depth discussion and thorough comments on all code, Paul Catanese clearly explains complex topics and prepares you for solving the everyday difficulties of 3D development. Built in a logical fashion, this book begins with the basics of 3D in Director: the environment, primitives, transformations, Lights, Cameras as well as explaining intermediate aspects such as surfacing, non-photorealistic rendering, particle systems, picking Lingo and the like. The second half of the book continues with performance and download optimization for 3D projects, bones animation, keyframe animation, and building custom schedulers before moving on to more complex topics such as vector math, creating meshes from code, mesh deformation, collision detection and much, much more.